The term "site-survey" gets misused and is consequently misunderstood and mistaken for what is in reality a wireless LAN assessment. 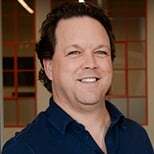 In today's Whiteboard Wednesday episode, Michael McNamee, Senior Network Engineer at SecurEdge Networks explains what the various types of Wi-Fi site surveys are, what they do and what they don't do as compared to WLAN assessments. Hi, I'm Michael McNamee. I'm a Senior Network Engineer here at SecurEdge Networks. Today's topic for our whiteboard session is Wi-Fi site surveys, and wireless LAN assessments. The first one I wanna talk about is the passive site survey, and what passive site survey is, it involves an engineer or wireless technician visiting a site - it could be a building, a facility, a campus - and they will use a device, whether it's a laptop or a tablet, running specialized software that measures the wireless signal from the access point to the wireless system. The act is passive, so there's no connectivity that's going on. It's just a measuring of the signal. And, at the end of the survey, a report is generated and this will show what the heat maps, or the coverage of the environment, looks like. It will potentially show dead spots, or areas where there may be insufficient signal. The second type of wifi site survey is an active site survey. This is in opposition to passive. It's similar to the passive site survey but, in this active site survey, the devices actively connected to the wireless LAN system, and while it's measuring the signal it's also doing some other performance testing. It's testing throughput latency, and even roaming performance. The next type of wireless site survey that I wanna talk about is a spectrum site survey. Spectrum site survey is used to detect sources of RF interference within a given space. It can be done in conjunction with the active and the passive site surveys, and it allows us to kind of get a holistic view of what's going on in the wireless space within a given area. The next type of wireless site survey I wanna talk about is a validation site survey. A validation site survey is done post-implementation of a wireless LAN project, and it's useful in giving feedback to let us know what the performance is and if the wireless LAN that's been installed meets the stated goals and the requirements from the customer. And then, finally, we have a predictive site survey. Predictive site survey, to me, is kind of a misnomer. It's really a predictive design. But what the process is, is it allows us to model a campus or a building or facility, or a given space, and allows us, through the use of specialized software, to load in attributes about that space length, width, height, you know, where else could be racking in a building. It could be elevator shafts. Things that it can become RF obstacles allows us to get kind of a predictive model of what it takes to put a wireless network into that space. And, from there, we can kind of start a project to do a budgetary quote, or just to get an understanding of what it would entail. The goal of this whiteboard session was to understand what wireless site surveys are, and differentiate them from wireless LAN assessments. The term "site survey" gets thrown around a lot, and I think it gets confused with what we deem, actually, to be wireless LAN assessments. The first assessment I wanna talk about is a wireless LAN assessment. This assessment is a process where we can get in to look under the hood at the configuration of the wireless LAN system, and it gives us some insight into if best practices are being followed and, if not, where are some of the pain points being induced into the system, and what kind of effect does it have, or what kind of impact is it having, on the performance of the end users on the wireless LAN system. The wireless LAN assessment can be done in conjunction with some of the site surveys to give us more of a holistic view of the wireless LAN system, and to get a better understanding of how, maybe, we can make it work better. The second type of wireless LAN assessment is a wireless LAN performance assessment. This is done with using test clients - could be laptops, tablets, phones, scanners - and they are configured as test clients, testing against a test client or a test server, and then simulating things like voice, video sessions, streaming YouTube, download and upload TCP/EDP sessions, and also measures signal coverage at the same time. The value in this is that it's giving us feedback from a client device on how the wireless LAN is performing. We're not seeing feedback from the wireless LAN infrastructure itself, which can be kind of skewed and biased, but from a client it's gonna give us a true, accurate portrayal of how the wireless LAN is performing. Maybe in the assessment, a report comes out that the laptops are working well, but mobile phones and tablets and hand scanners aren't working well, so that allows us to understand the adjustment that we can make to the system to make it work better for those devices as well as the laptops. 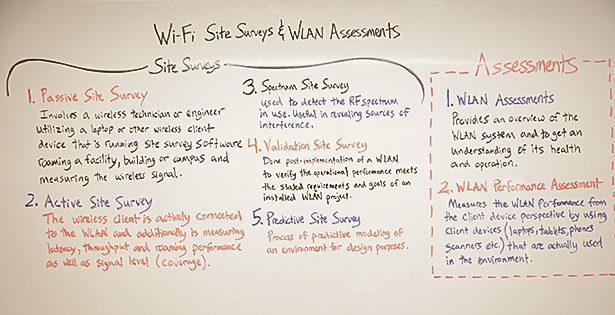 As I mentioned before, the goal of this whiteboard session was to clarify what a wi-fi site survey is and what a wireless LAN assessment is. I hope that we've achieved that for you and, if you guys have any questions or comments for us, please post them down below. Thank you for watching, and hope to see you next time.